Another 25 wins & 41 nominations. The whole is absolutely amazing. Tom Cruise gave an excellent performance as the sports agent with a heart. Someone for who money isn't the most important thing. It's all about the relationship between the sports agent and his client. What's so great about "Jerry Maguire", is the fact that the movie isn't about who Jerry Maguire really is, it's about who he wants to be. I loved Cuba Gooding Jr. By far his greatest role ever. Let's not forget Renée Zellweger and her cute son, amazingly performed by the young Jonathan Lipnicki. Both where very good. Perfect casting for Zellweger. I read in the trivia that the title role was written for Tom Hanks. Don't get me wrong, Tom Hanks is an excellent actor, but to play an ambitious and arrogant sports manager (what Jerry Maguire was at the beginning of the movie), you need to have Tom Cruise's face. He was just perfect for the role. I can't think of anybody who could have done this as good as he did. 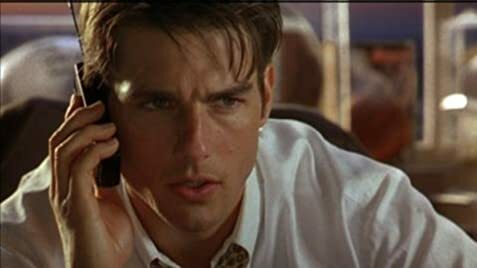 So my conclusion for Jerry Maguire: If you haven't seen it, you should definitely see it. If you have seen it, I hope you can agree with me. This movie is wonderful, as where are used from Cameron Crowe-movies. Cameron Crowe offered the Dorothy Boyd role to Janeane Garofalo, if she could lose weight, but after trimming down, she learned that Renée Zellweger had won the part instead in what was to become a career-launching smash hit. Jerry Maguire: I'm sorry to hear that. I think you're making a big mistake. I'm concerned about you, your family and your future and if you stay here, I don't know what's going to happen. The box of stuff that Jerry carries out of his office before "not flipping out" doesn't make it into the elevator when he leaves. In the original theatrical version, during the airport sequence after Jerry and Rod argue, the Paul McCartney song "Momma Miss America" is played. In the television version, Aimee Mann's "Wise Up" is used instead.